Fans of Ford base vehicles have plenty to cheer about at the moment: the eagerly awaited new Transit will underpin several 2015 motorhome ranges and Wellhouse Leisure’s Terrier, based on the Ford Tourneo people carrier, launched to wide praise last autumn. Another Ford conversion, the Auto Campers Leisure Van – this time on the short wheelbase Transit Custom, which is the same size as the Tourneo – debuted at the February NEC show. Conceptualised and designed by Roy Wood Transits in Berkshire (a firm that has enjoyed a 44-year relationship with Ford), the Leisure Van starts from an eye-catching £29,995 – £10,000 less than the Terrier’s base price. The Leisure Van is a straightforward proposition, offering one floorplan and a choice of three roof styles: low-line, high-line and pop-top. The living quarters eschew the well-established campervan combination of side kitchen and rock’n’roll bed in favour of a row of three travel seats behind the driver, in front of rear longitudinal kitchen units on both sides of the vehicle. The kitchen units are the base for a 1.67 x 1.98m (5’6” x 6’6”) double bed, which is easy to assemble and dissemble with no heavy lifting required. The Leisure Van is therefore an attractive option for buyers looking for a sub-5m everyday drive that converts easily into a home-from-home when required. Wellhouse Leisure will conduct the conversion work on production models, so buyers will be getting a top-quality product. We tested the version with the high roof, based on the Transit Custom Trend. One up from the base trim level, this adds a slew of useful options for a modest outlay. For £2040 you get goodies including cruise control, heated windscreen and exterior mirrors, front and rear parking sensors, front fog lights, daytime running lights, automatic lights with projector headlamps, rain-sensing wipers and a leather-wrapped steering wheel. Entrance to the Leisure Van is via the nearside sliding door that opens to reveal a row of three belted travel seats. The seat nearest to the door is removable; to use the vehicle as a camper, you’ll need to take it out, otherwise you won’t be able to access the rear. It’s heavy and there’s definitely a knack to it, but it’s straightforward when mastered. In the high roof version (a £2500 option), the interior of the Leisure Van works well. A person of around six-feet tall can stand up inside, and although its 2.44m height means you won’t be able to sneak the vehicle under a height barrier, the roof is fully insulated and heat loss will be less than in the pop-top variant (£3500 more than the low-line version). A fold-up picnic table is located next to the fridge, ready for when the rear doors are open. This raises on two arms and allows users to extend the kitchen outdoors. Folding camping chairs will fit in pockets fixed to each rear door. But if the weather isn’t up to it, you can easily relocate to the midships lounge, formed by rotating the front seats and attaching a tabletop to a swing-out bracket on the offside. This creates a sociable space for up to four people. The nearside galley features two gas burners and a deep sink with folding taps; glass lids boost the amount of preparation space when closed. The work surfaces have grey textured finishes with rounded edges, and drawers take precedence over cupboards – a practical addition making it much easier to retrieve items. A low-power-consumption 42-litre compressor fridge sits on the floor opposite, so spec-wise you’ve the means to fry, boil and store food. There's a hinged worktop extension flap that you can use when you have the 'van's back doors open, so this encourages al-fresco dining, in true campervan style. There is absolutely no heavy lifting required to make up the bed – just move the folded-up base clear of the offside hinged support flap and once it’s in position, spanning the furniture units, reposition and unfold the bed base. The whole process takes seconds. The Leisure Van’s comfortable double bed measures a generous 6’6” by 5’6”. There are spotlights for reading, plus a blue night-light setting. When it's not in use, the folded bed base secures to the offside wall via Velcro. There’s also storage for bedding, under this flap. There is no washroom in the Auto Campers Leisure Van, but there is a portable Dometic toilet hidden in a locker in the kitchen unit, at the opposite end to the fridge. Four deep overhead lockers with a smart-looking aluminium extrusion underneath run along each side of the ’van. They have positive catches and struts, and, like the kitchen units below, are made from ply faced with a high-gloss, cream-coloured, high-pressure laminate. There are LED lights in the Auto Camper Leisure Van. The 115AH leisure battery is charged by the Transit van's 150AH alternator, and is independently switched via a automatic split relay. You'll get 12V power on the move and 240V when you're on an electric hook-up at a campsite. There's an intelligent charger to maintain both the leisure and vehicle batteries. The passenger seat in the cab rotates. There are proper seat belts for five passengers. The fifth seat, in the rear, is removable, to allow better access when you are using the vehicle for camping. Optional 2KW Webasto unit provides diesel-powered thermostatically controlled blown-air heating. Cab air conditioning is also optional. 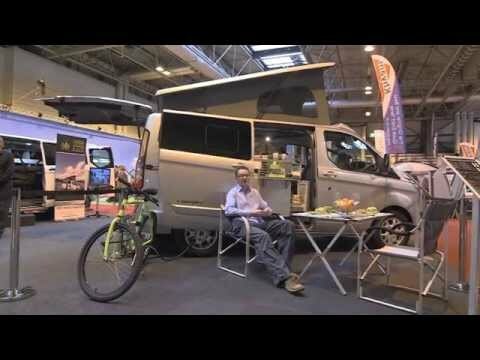 We’re big fans of the Transit Custom base vehicle, and the Auto Campers Leisure Van is a well thought-through camper. Versatile and affordable, this is a viable and appealing alternative to Volkswagen T5-underpinned offerings.